Wednesday and schedule changes…just when you get in the groove along comes another schedule change and that means dinner for one which also means something that Michael wouldn’t enjoy eating and I can feast on things like mussels. Two 2 pound bags sounds like a lot, but consider the fact that they come in a shell and that is the weight of the package. Someday I’ll weigh the little gems out of their shells. I love Julia Child’s recipe so that is what I am going for tonight along with those lovely little morsels with anchovy-provolone crostini and a good salad with one of my favorite simple vinaigrettes. Whisk together the flour and 4 cups of water in a large mixing bowl. Add the cleaned mussels to the flour-water mixture, topping off with water as needed to cover the mussels. Allow the mussels at least an hour of soaking time in order to ensure that they disgorge any sand and grit. Bring the wine, minced onion, parsley sprigs, bay leaf, thyme, pepper, and butter to a simmer in a large (6+ quarts) stockpot over high heat. Meanwhile, drain the mussels from their flour and water liquid, and rinse once more. Add the clean mussels to the stockpot, top with the lid and shake vigorously from time to time, in order to ensure that the mussels cook evenly. Continue with this for 5 minutes, or until the majority of the mussel shells have opened (this is your indication that they’re cooked through). I made Giada’s anchovy toasted crostini with provolone to serve alongside the big bowl of mussels. 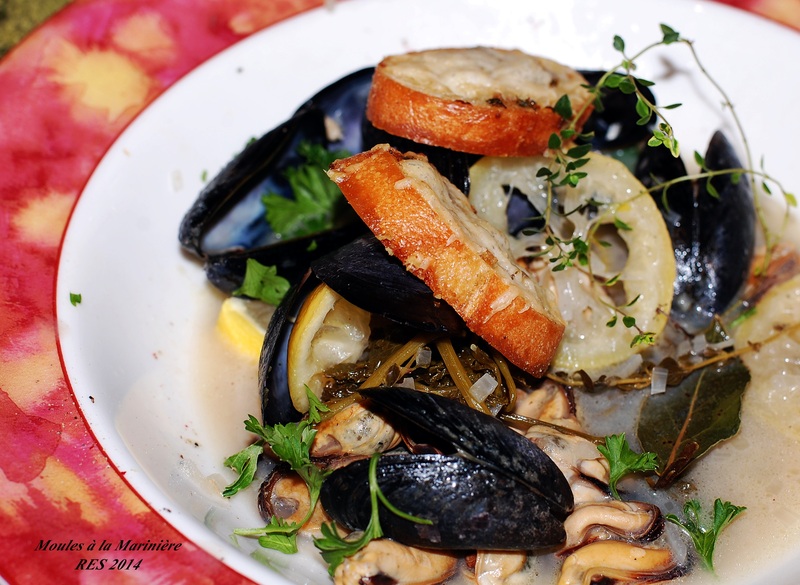 Note: Discard any mussels whose shells are cracked or open when raw discard ones that are not open after steaming.